This page contains pictures and information about the Scentless Plantbugs in Family Rhopalidae that we found in the Brisbane area, Queensland, Australia. 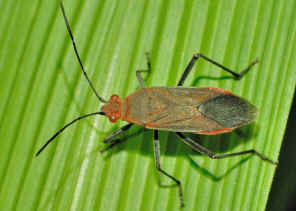 Scentless Plantbugs in Family Rhopalidae are closely related with Coreidae but lacking well-developed scent glands. We found two Leptocoris sp. in this family. 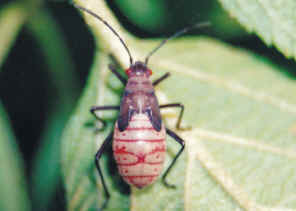 From the reference information, bugs in genus Leptocoris are seed predators of plants in family Sapindaceae. 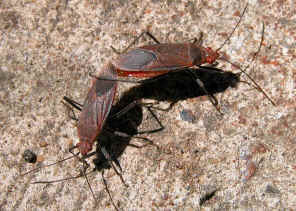 They are also known as Soapberry Bugs. 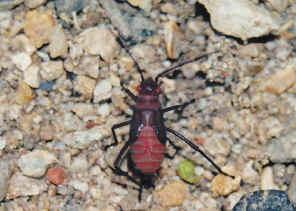 The bug has bright red eyes and red abdomen. Its thorax and front wing covers are reddish-brown in colour. Its legs and antenna are all on black. This bug is common in Brisbane gardens and backyards. They feed on the plant seeds. Please visit this page for more information. The bug has bright red eyes and red abdomen. Its thorax and front wing covers are reddish-brown in colour. Its legs and antenna are all on black. This bug feeds on ripe seeds that fallen on ground. They run fast with their long legs. Please check this page for more pictures and information. 1. Insects of Australia, CSIRO, Division of Entomology, Melbourne University Press, 2nd Edition 1991, pp 504. 3. RHOPALIDAE Scentless Plant Bugs - Save Our Waterways Now, 2008. 4. Family RHOPALIDAE - Australian Faunal Directory, Australian Biological Resources Study. 5. Ecology of Leptocoris Hahn (Hemiptera: Rhopalidae) soapberry bugs - Carroll Scott P, Loye Jenella E, Dingle Hugh, Mathieson Michael, Zalucki Myron P, Australian Journal of Entomology, 44. 344-353, 2005. 6. Studies on the biology, immature stages, and relative growth of some Australian bugs of the superfamily Coreoidea (Hemiptera: Heteroptera) - Kumar, R. 1966, Australian Journal of Zoology 14: 895-991 . 7. Soapberry Bug's photostream flickr - About Soapberry Bug / Scott Carroll. Last updated: September 03, 2010.